Thanks for visiting. I hope you find something useful here. 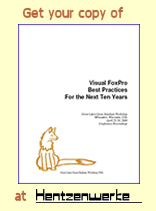 The complete proceedings of the 2006 Great Lakes Great Database Workshop are now available as an e-book entitled Visual FoxPro Best Practices for the Next Ten Years. Presented by 10 internationally-known experts, individually and on panels, the workshop covered virtually every major aspect of FoxPro development best practices. This 415-page e-book contains all of the conference whitepapers combined into a single PDF file. You also get all 14 slide presentations in their entirety along with all source code for the sessions. Topics include: Development Environment Setup Error Handling and Reporting Class Design User Interfaces Local and Remote Data Access Refactoring Debugging Reporting Project Management Vertical Application Development Middle-Tier Design Deployment and Professional Developer's Toolkit. Ship it! Music to your ears or words that cause a cold sweat as you realize you now need to deploy the solution you have worked on for so long? Have you planned the deployment? Do you have the proper language in your contract with your customer? Do you have the proper install package? Do you even know what features your installer needs or how to use one of the many installers? What media is the package going to be shipped on to the client? How will it be distributed? Is the customer even ready? What happens after setup.exe finishes? Do you have the support infrastructure in place? How are you going to handle updates and changes? There's a lot to think about, and deploying a solution requires careful planning. These questions and many more are answered based on real world experience within the pages of this book. This paper introduces both the Ruby language and the Rails framework, focusing on their installation and use on a Windows® platform with a perspective geared toward experienced Visual FoxPro® developers. It was written before Rails 3 was released, and is therefore based on Ruby 1.8.7 and Rails 2.3.9. The fundamental concepts still apply to newer versions of Ruby and Rails, but if you are just getting started I recommend you use the current versions of both the language and the framework. Updated 03-Jan-2005 Age Calculator is a Visual FoxPro® class to calculate a person's age in years, months, and days. This release features a complete replacement of the core logic using custom methods to handle the calculation of 'next month' and 'next year' and gives more accurate results when the date range starts on day 29, 30, or 31 and spans several months or years. Updated 30-May-2003 Zip Automation Manager is a Visual FoxPro® class that allows you to run WinZip® programmatically. Using Zip Automation Manager, you can to control WinZip® from within your VFP application to create ZIP files (archives), add files to existing ZIP archives, and extract files from ZIP archives. See the help file to find out what's new in this version. WinZip is a registered trademark of WinZip Computing, Inc. Visual FoxPro is a registered trademark of Microsoft Corp. Updated 30-Jan-2003 rbInputBox() is a simple, general-purpose input box for Visual FoxPro. Unlike the native InputBox() function introduced in VFP 7.0, rbInputBox() can handle character, date, numeric, and currency data types as well as providing other functionality not available in the native InputBox() function. New in this version of rbInputBox() is the ability to set the PasswordChar property of the textbox, which allows you to accept a masked password. Previously released as InputBox() for VFP 6.0, the name was changed to avoid conflicts with VFP's own InputBox() function in VFP 7 and later. Updated 16-Oct-2000 Use this class to make numeric data display the way you want it to while it's being entered. You can choose adding machine style (implied decimal) or calculator style (explicit decimal). Comes with a sample form and a readme file with examples. Now works in grids, too. The latest update enables default behavior for the PgUp and PgDn keys to enhance the functionality of this class when it's used in a grid. Also, the InteractiveChange() method is now called as each digit is entered to better simulate the behavior of the native textbox. See the readme file for complete documentation and release history. This class is an ongoing enhancement of the original 'txtnumber' class by Jim Booth. Updated 19-Jul-2000 A ready-to-use progress bar with a dynamic title and message in a simple, nice-looking form. Distributed as a Visual FoxPro 6.0 class library. The 19-Jul-2000 release is updated to use version 3.0 of commctrl.vcx, which is included in the download archive. New 22-Dec-1999 Display a "Tip of the Day" at startup or from your 'Help' menu. You've seen this feature in other apps, now you can easily add it to your own VFP apps. Distributed as a Visual FoxPro 6.0 class library, works with VFP 5.0 too. An implementation of the Visual FoxPro ActiveX calendar control. Click a button to bring up the calendar, click a date to put it into a text field. Comes with a demo and an explanation of how to use it. JumbleTron is a Visual FoxPro® class to jumble a block of text by rearranging the letters in the middle of each word while leaving the first and last letters the same. Check out my blog entry for the idea behind this toy. Sites are listed alphabetically. Please report broken links. 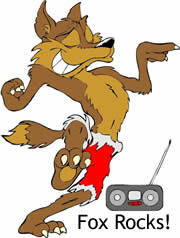 Steven Black's FoxPro Wiki is an outstanding resource for VFP developers. "Expert advice on Microsoft® Visual FoxPro® Development", from Advisor Media, Inc.
Resources, links, and downloads for VFP developers. Microsoft, Windows, and Visual FoxPro are either registered trademarks or trademarks of Microsoft Corporation in the United States and/or other countries. All other trademarks are the property of their respective owners. ITA is a registered service mark of Information Technology Associates.